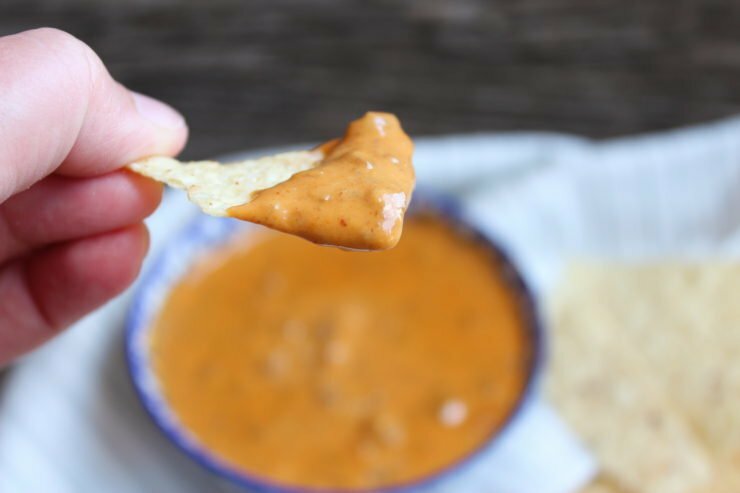 I don’t know what it is about the fall and winter that gets me into the party food spirit, but this Chili’s Queso Dip Recipe is one of my favorite go-to dips for the colder months. 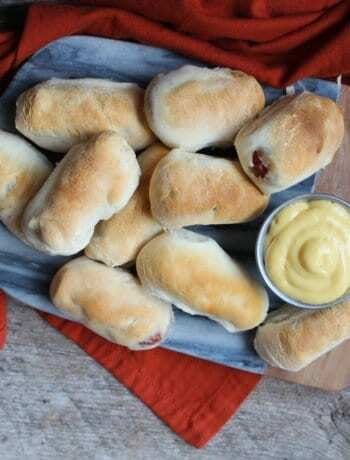 My Mom always made a Velveeta Cheese Dip very similar to this one before we even knew what Chili’s was; remember, we lived in a small town with no major chain restaurants. It was one such cool fall morning when my Mom was preparing for a party that she was hosting (probably my twelfth Birthday party, though I can’t recall exactly) when all hell broke loose. We were having some problems with the kitchen sink not wanting to drain (this wasn’t a garbage disposal, just a regular sink) and one just can’t have stinky standing water in the sink when guests are arriving later that evening! My Mom, being the determined woman that she is, absolutely refused to bother Dad with the problem, although I suggested worriedly that maybe we should wait on him to take a look. Now, you’ve got to understand that my Mom is the type that would rather fix something on her own than to ask for my Dad’s help – mostly due to the fact that when something needs doing, she wants it done right away! haha! However, the other thing you need to know is that Mom’s home DIY’s are notoriously known for causing more problems than they fix, hence my suggestion to wait on Dad. Mom got the Chili Queso Dip on to cook, set me in front of the stove to keep a watch over the dip, then she went to work on the sink. She had these huge, rubber, yellow gloves that she always wore when something serious needed fixing and I watched with trepidation as I saw her pull those gloves on with a glint in her eye and a determined set to her jaw. Something was about to go down – I just wasn’t sure if it was Mom or the sink that would win this battle. After a cursory examination of the sink which didn’t yield any results, Mom rustled around in the cabinet for something that might prove more effective than jamming a butter knife as far down the drain as possible. After a few minutes of frustrated searching, Mom came out from underneath the sink cabinet with a big bottle of Drain-O. Now, I was no expert at sink-fixing but I just had a sinking feeling in the pit of my stomach that dumping Drain-O down the kitchen sink (which had plastic piping) just wasn’t the best idea. I pitched in with my two cents worth, but Mom was not to be deterred. She assured me this would “fix it quick” and then proceeded to dump the nearly full bottle of Drain-O down the kitchen sink. 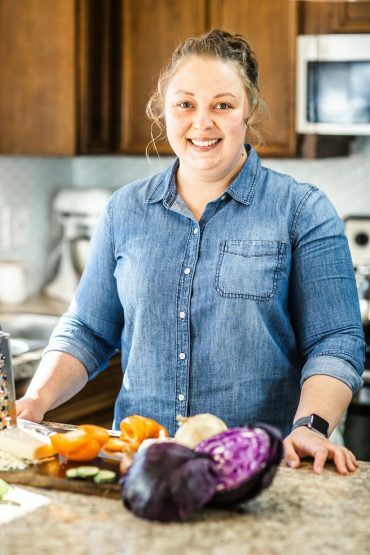 As she stepped back to watch her handiwork with a look of smug satisfaction, we began to hear a trickling sound that quickly increased in volume – and it seemed to be coming from under the sink. Our eyes widened in horror as we realized the Drain-O was eating a hole straight through the piping and was slowly beginning to drain the sink’s contents into the cabinet, which was spilling out onto the kitchen floor. As we rushed to find buckets and remove the items stored under the kitchen sink, mom faced me with a look of chagrin and uttered her famous last words, “You better not tell your Dad about this!” haha! I kept the secret and to this day, I never told Dad. In fact, I didn’t have to. When he came home and smelled the putrid odor of Drain-O mixed with whatever noxious substance that was stuck in our kitchen sink, he figured it out pretty quickly. The kitchen sink plumbing wrapped heavily in duck tape might have clued him in as well. Whatever the case, he ended up having a much larger project on his hands than he would’ve had in the beginning had we just waited on him. It all turned out well in the end though; the Chili Cheese Dip was delicious and the party that evening continued on as though nothing had ever happened. You want to start out by adding 15 ounces of no-bean chili (use your favorite brand- ours is Armor) into a medium sized pot. 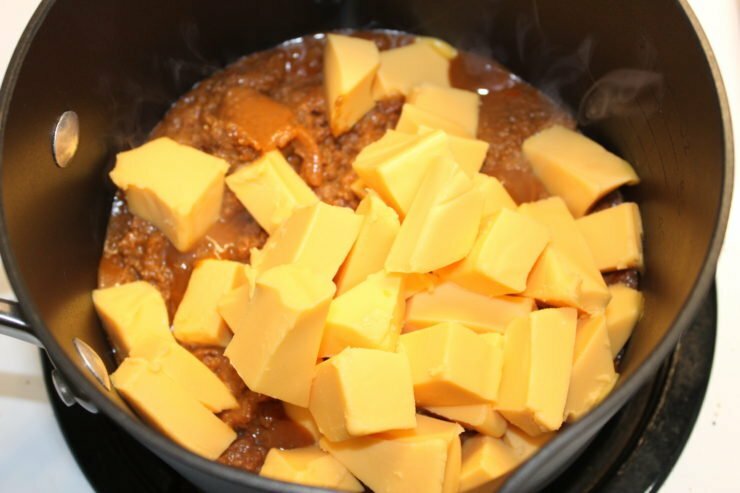 Once the chili has been added, turn your heat on medium, then start cubing some Velveeta Cheese. You’ll want 16 ounces (or half of a 32 ounce block) of Velveeta Cheese cut into cubes. 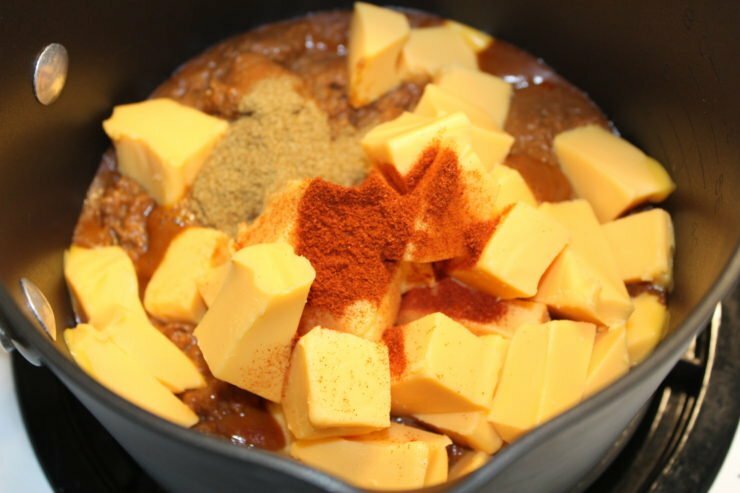 Once the chili and the Velveeta Cheese has been added to the pot, add in 1/2 teaspoon of paprika and 1/2 teaspoon of Cumin. 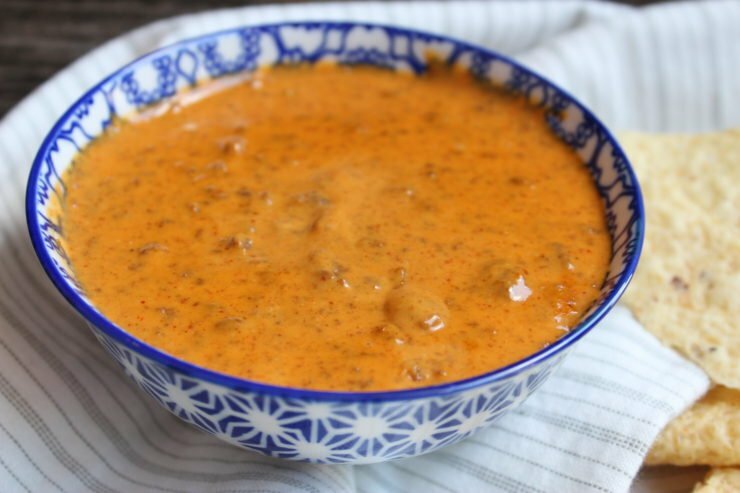 The addition of the Paprika and Cumin give this Chili Cheese Dip such a wonderful flavor and also lends it that authentic, Chilis Restaurant Queso taste. If you’re fresh out of paprika and cumin but you have Taco Seasoning on hand, you could use that as well – although it will make the cheese dip saltier so watch how much you use! Okay, so you’ve added in the chili, Velveeta cheese, paprika, and cumin, now you’re going to add in 1/4 cup of evaporated milk. If you don’t have evaporated milk on hand, you can use any grade of regular, cow’s milk as well. 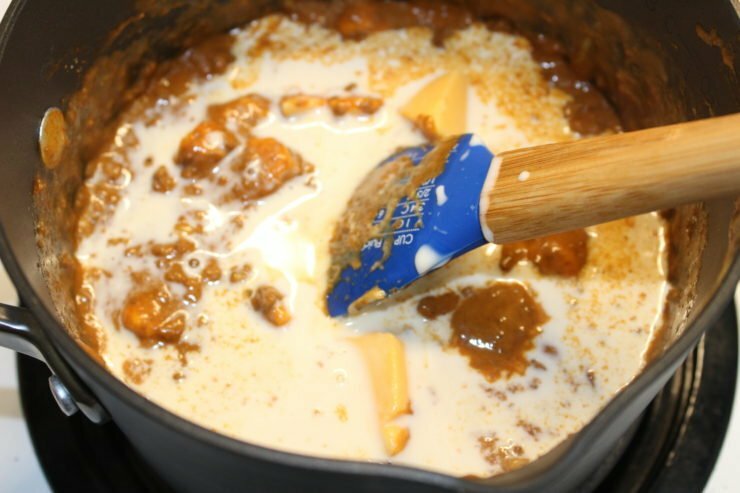 I like to use evaporated milk because it gives this Copycat Chilli’s Skillet Queso a slightly creamier flavor, but regular milk will also work just as well. Since your heat is still on medium, you should begin stirring your Chili Queso and continue to stir from now until the cheese is completely melted. I also added in 1/2 teaspoon of garlic powder at this point. 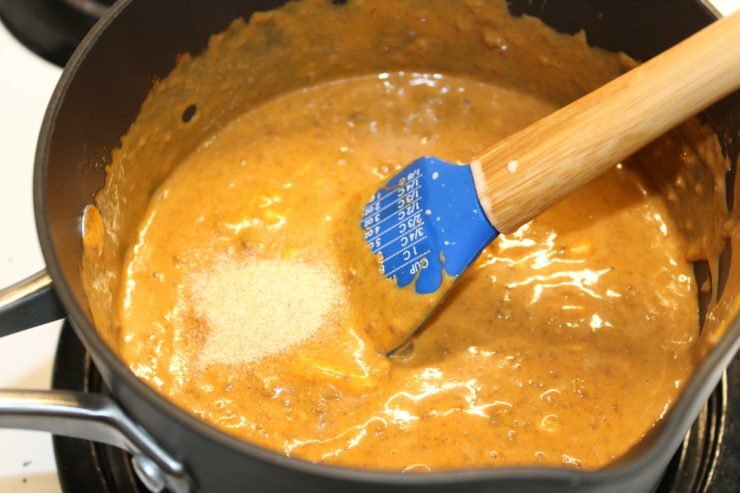 Continue stirring the Chili Queso Dip until all of the cheese is completely melted and the ingredients are well blended. 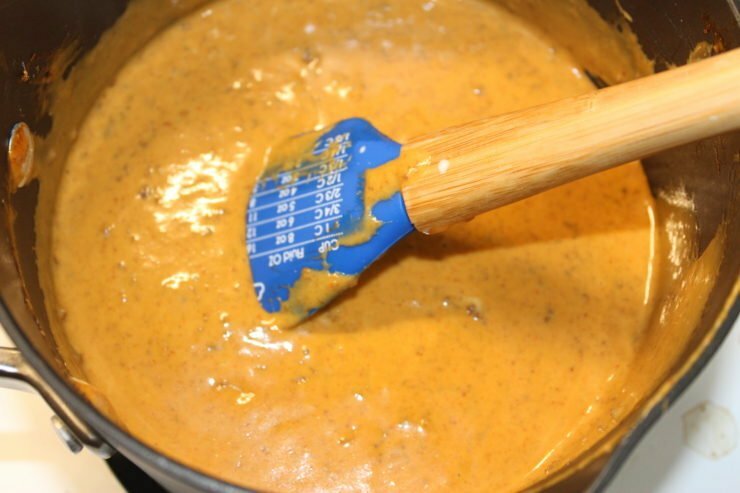 It’s important to continually stir this queso dip so that the cheese does not get too hot and burn. Once the Velveeta Cheese is completely melted in the queso, your Chilis Skillet Queso is ready to serve! 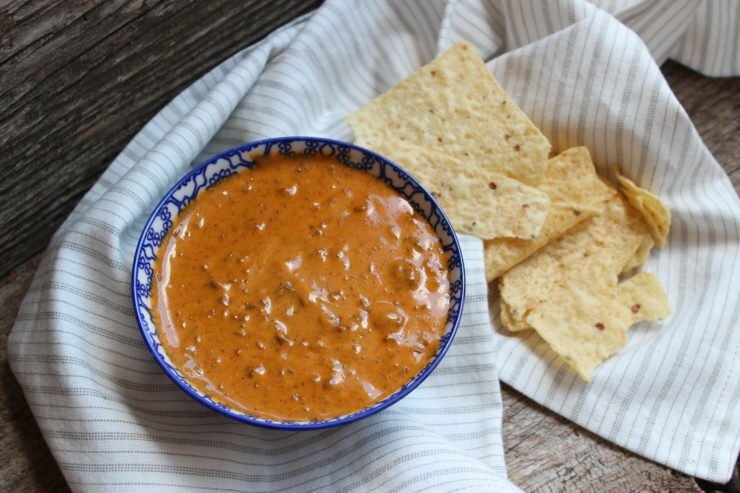 If you’re serving this Queso up for a holiday party, I suggest putting it in a pretty seasonal bowl and adding some tortilla or corn chips to the side for dipping. 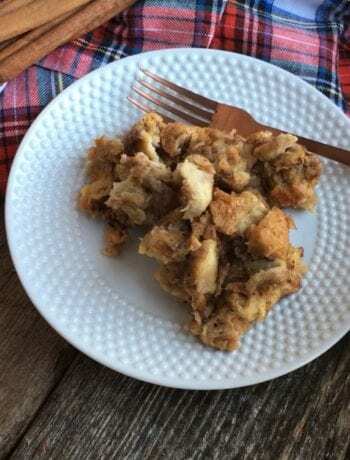 This is such a fun dip for the upcoming fall and winter seasons because it’s warm, hearty, and delicious! By the way, if you love dips, try my Tex Mex Queso Blanco Dip and my Easy Baked Spinach Artichoke Dip. I hope you have enjoyed your time in my kitchen today because I have sure enjoyed having you here! 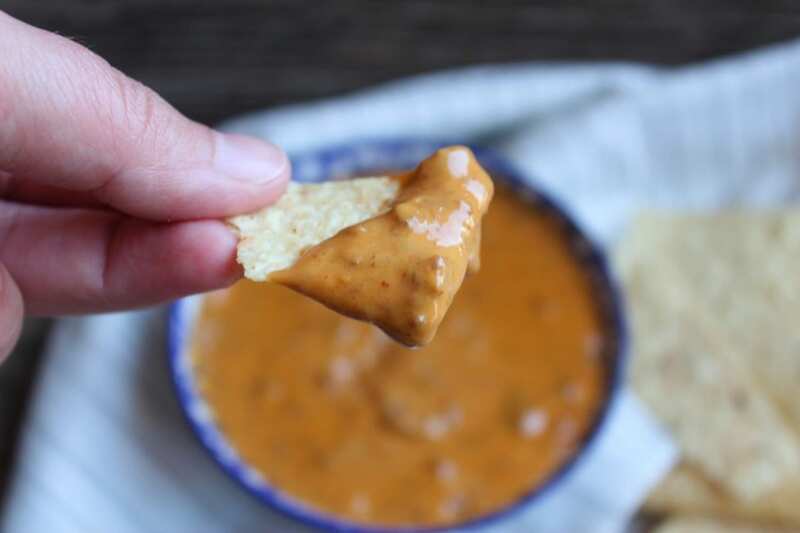 Chili's Queso Dip is a Chile Con Queso style Velveeta Cheese Dip that is fast, easy, and delicious to make for parties, football season, or game night. Place all ingredients in a medium sized pot and begin cooking on medium heat, stirring continually. Continue to stir as the cheese melts and stir until all cheese is melted and all ingredients are well blended. Remove from the heat, serve in a pretty dish with tortilla chips or corn chips and enjoy! 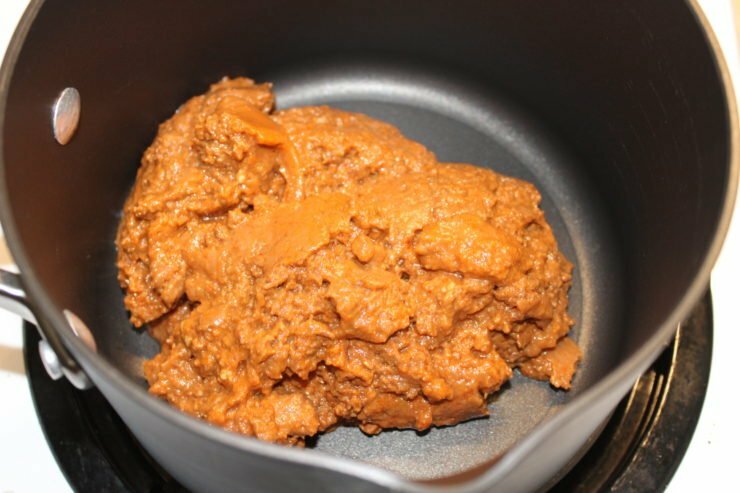 Store left over Chili's Queso Dip in an airtight container in the fridge for up to 4 days. 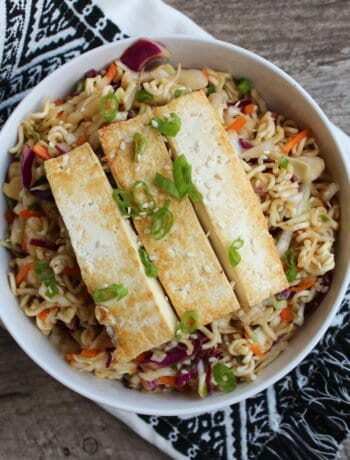 This is a great copy cat recipe. 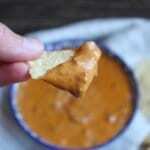 I love Chilis Queso Dip and can’t wait to try your recipe! Thanks so much for sharing your post with us at Full Plate Thursday and hope you have a great week!